Find a Bicycle trip that explores Czech Republic. There are 10 tours to choose from, that range in length from 7 days up to 9 days. The most popular month for these tours is August, which has the most tour departures. "This was a lovely cycling tour with a great guide and driver." 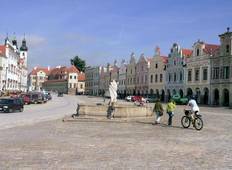 "We recently enjoyed the 'fit' Salzburg to Prague bicycle self-guided bicycle tour...."